Houston, TX, November 16, 2018 – Panera Bread® is partnering with Addi’s Faith Foundation to join the battle against childhood cancer. 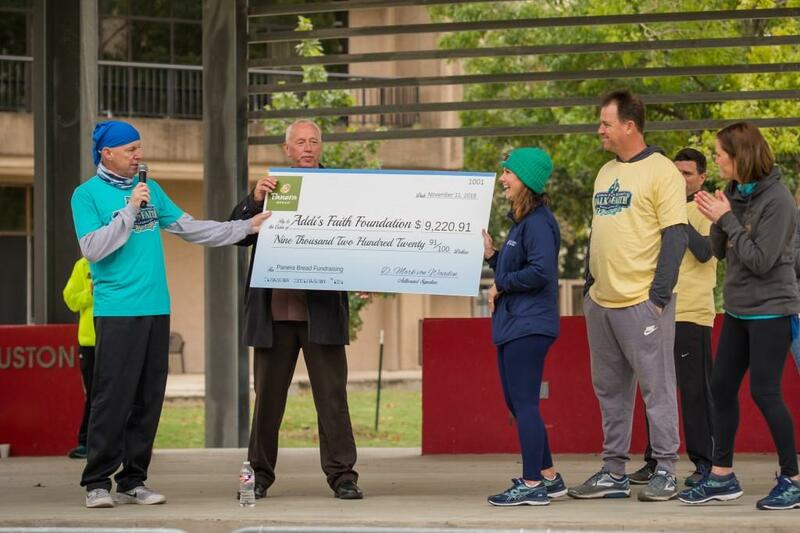 On Sunday, November 11th, Rolling Dough, Ltd. & The Cain Holding Group; the two Panera Bread® franchisees in Houston, College Station & Lake Jackson; presented checks totaling over $9,000 to Addi’s Faith Foundation. These donations are part of Panera Bread’s Community Giving™ program, where a portion of the sales from certain items are put into action through Panera’s partnership with Addi’s Faith Foundation; in order to assist them in their ongoing mission to find a cure for childhood cancer. “These donations are fueled by our amazing customers, and are a clear indication that they stand with us in our commitment to those in need,” said Keith Isbell, Chief Operations Officer of Rolling Dough, Ltd. “Panera Bread is honored to work alongside our customers to support Addi’s Faith Foundation and their mission”. “We are always looking for new and exciting ways to raise funds and awareness for the fight against childhood cancer. Everyone loves Panera and we knew that an awareness cookie would be a great way to celebrate Childhood Cancer Awareness Month in September. It’s really a no-brainer when you take a great cookie and a great cause and create a product that people can feel good about purchasing. Less than 4% of research funding is allocated to pediatric cancers so it’s crucial that organizations like Addi’s Faith step up and fill some of the gap. We’re really grateful to Panera Bread for joining us in our mission,” said Amber Bender, Founder and Executive Director of Addi’s Faith Foundation. 30 years ago, at a time when quick service meant low quality, Panera set out to challenge this expectation. We believed that food that was good and that you could feel good about, served in a warm and welcoming environment by people who cared, could bring out the best in all of us. To us, that is food as it should be and that is why we exist. So we began with a simple commitment: to bake fresh bread from fresh dough in every bakery-cafe, every day. Each night, any unsold bread and baked goods were shared with neighbors in need. These traditions carry on today, as we have continued to find ways to be an ally to our guests. That means crafting a menu of soups, salads and sandwiches that we are proud to feed our families. A commitment to transparency and options that empower our guests to eat the way they want. And a commitment to removing artificial additives (flavors, colors, sweeteners and preservatives) from the food on our menu. We think that simpler is better and we believe in serving food as it should be. Because when you don’t have to compromise to eat well, all that is left is the joy of eating. As of November 1, 2018, Rolling Dough, Ltd. owns and operates 21 bakery-cafes in the South & East areas of Houston, TX; as well as Beaumont, College Station & Lake Jackson, TX, all under the Panera Bread® name. Inspired by one little girl’s battle with brain cancer, Addi’s Faith Foundation was formed in hopes of freeing the world from childhood cancer. By funding critical pediatric research, AFF ensures advancements are made and that less toxic, yet more effective treatments are found. Until the cure is discovered, Addi’s Faith Foundation desires to provide emotional and financial support to parents as they care for their child with cancer. A registered 501(c)3 charity, Addi’s Faith Foundation has distributed over 1.5 million dollars since their inception in 2008.